Your documents are available wherever you have access to the Internet, but sometimes you need to get work done when you’re not connected to the web. The good news is that you can download a copy of your document and work on it without an Internet connection, and then you can upload it later when you do. 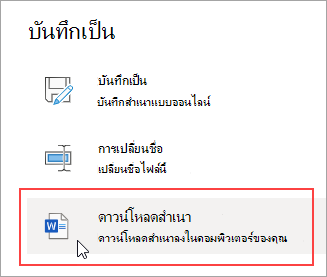 เคล็ดลับ: If you have the OneDrive desktop app, you don’t need to download a copy—you already have your OneDrive files on your computer. Any changes you make to the files in the OneDrive folder on your computer will automatically sync the next time you connect to the Internet.